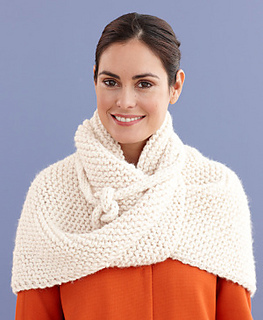 A circular needle is used to accommodate the bulky stitches. Work back and forth in rows on circular needle as if working on straight needles. 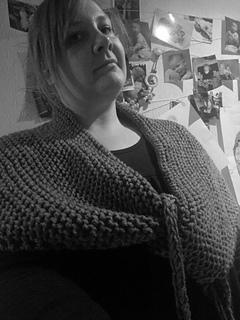 Wrap is worked from the point up. Wrap is worked in Garter st (k every row), so there is no real RS or WS. Ties are worked in St st (k on RS, p on WS). Edges of ties will naturally roll slightly. With sewing needle and thread, sew a few stitches through the Wrap and the base of the tie to reinforce the area. 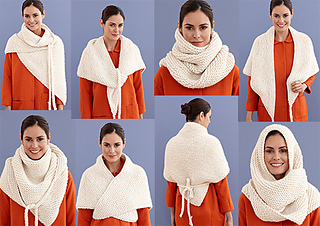 L20302B features photo tutorial showing how to wear the wrap in different ways. 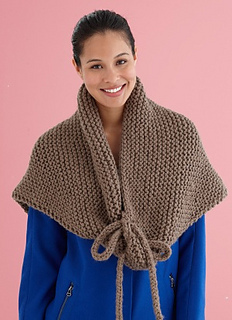 See Triangle Wrap for a smaller version in Wool-Ease Thick & Quick.